In today’s modern life, a business system that can continue on without stopping access both by customers and internal party company, has become a necessity. Competition in the financial era fintech and digital transformation process that a lot of companies, making many business systems faced with an enormous challenge. Therefore, implementing Disaster Recovery Plan and also did hosting the DRC is essential to be able to maintain IT operating companies are expected to run continuously. Increasing cyber attacks that have brought the world of information technology increasingly haunted by a scary image. Business today must always be a cease-and-desist cyber attacks. If an attack occurs, practitioners sometimes forget the purpose of safeguarding mission critical businesses to remain operational. Many companies are affected by downtime due to cyber attacks. For example, on November 11, 2016 5 banks in Russia is flooded with data packets through a DDoS attack (Distribute Denial of Service) is stopping their operations. According to the experts at Fujitsu, the attack comes from the device IoT on CCTV being used. Other examples of cyber attacks that make business operations are halted Lloyds Bank in London, England. It happened at the end of January 2017. In general, the banking companies usually have their own website hosting DRC. And as we know in Indonesia, may very rarely banking companies using outsourced data center. They are quite well established in qualified compliance regarding hosting DRC. However, on two occasions cyber attacks both in Russia and in the UK, we can see the similarities that such attacks were able to undermine the banking services. In this case we can understand the fact that “No one is immune to downtime” even for the bigger enterprise. 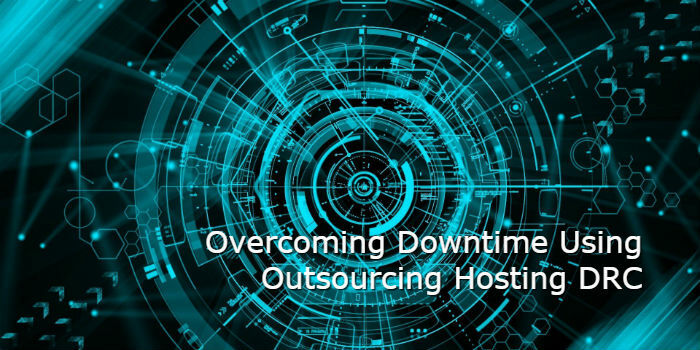 Overcoming Downtime Using Outsourcing Hosting DRC. Downtime can not be unpredictable when it will happen, but it can be minimized time. This will require a backup infrastructure to separate locations with a certain distance and have a higher level of security. The data center provider in Indonesia that has been certified by the Uptime Institute and ISO 27001 reliable as outsourcing hosting DRC for the world of banking and fintech established (registered with the Indonesian FSA called “OJK”). The use of third-party hosting DRC as disaster recovery services are not yet familiar in Indonesia. In entering the era of financial fintech and face cyber attacks are increasing, the banking company may re-assess the disaster recovery plan (DR Plan) and using a new strategy. In the event of downtime, administrators can instantly fix or roll-back in a short time. Disaster recovery technology on an external hosting DRC must also be adequate. Ability fail-over and fail-back will be a factor in determining the DRC will use a hosting service or not. Generally, the technology used by the hosting provider DRC should be able to perform fail-over and fail-back period of 2 hours. In fact, based on testing done by one provider of cloud disaster recovery (Disaster Recovery as a Services) can perform fail-over within a matter of seconds to 15 minutes. The choice is, use the DRC from certified TIER III data center providers who are skilled and experienced, or wait downtime comes first. The calculation of losses as a consequence of downtime can be your consideration in addition to the case of the collapse of banking services mentioned above. Downtime occurs in all business sectors and can involve a lot of costs, which could otherwise be much reduced by the use of outsourcing disaster recovery center that has a strong infrastructure and adequate technology. Elitery present as a provider of data center infrastructure and technology of international standard Disaster Recovery best. Elitery DRaaS technology makes it possible to quickly and easily connect with your back-end systems. Please contact our team at +62-021-750-2976 or simply fill out the contact form below. We would love to be a reliable partner to maintain the smooth operation of your IT.